The Alliance for a Green Revolution in Africa (AGRA—Soil Health Program) funded project—Supporting the West Africa Soil Health Consortia (WASHC), which was initiated to facilitate a wider uptake of better adapted Integrated Soil Fertility Management (ISFM) practices with visible positive impacts on rural livelihoods, has officially ended today 31 March 2017. Kayode Are explaining the information products produced by IAR&T at the display of materials produced by the various partners during the project. 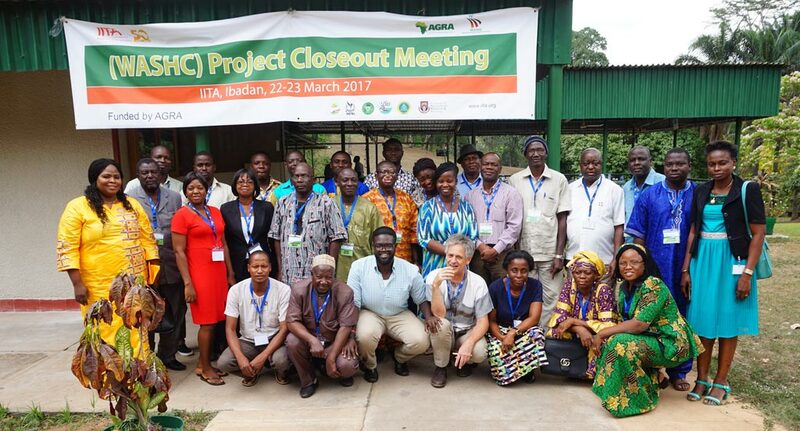 To celebrate the milestones recorded between 1 October 2013—31 March 2017, when the project was active, project participants converged on 22-23 March, in Ibadan and shared their experiences in helping to promote good soil health in West Africa. Led by IITA, the project successfully established six soil health consortia in Burkina Faso, Ghana, Mali, Niger, and two in Nigeria, covering the northern and southern regions. These soil health consortia expended a lot of efforts on raising awareness and sensitizing various stakeholder groups on ISFM through training and sensitization workshops, having observed that knowledge and information on ISFM is rather limited. The consortia are also now generating a lot of enthusiasm and support from relevant bodies. In each of these countries, there is a strong consensus on the need for a soil health consortium and platform for various stakeholders to propagate and facilitate the scaling of ISFM, even though it is not an easy proposition and difficult to sell. Consortia in each country have likewise taken steps to formalize themselves and as such assure continued operation of the consortia, while also looking for funding opportunities for the benefit of each of the consortia. 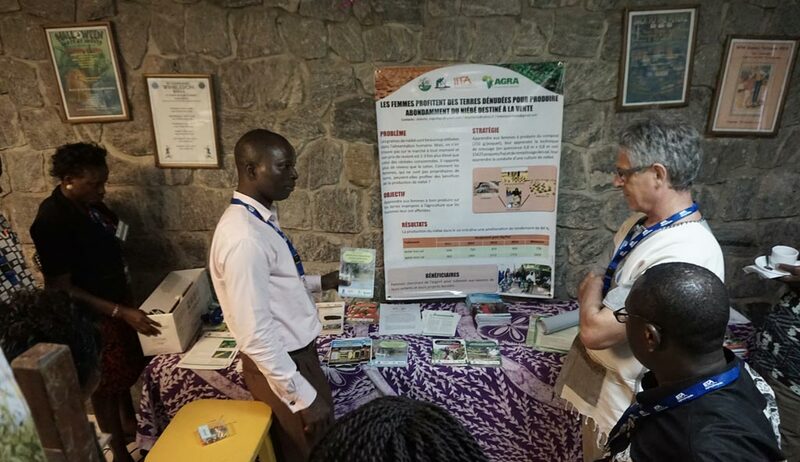 “To improve the dissemination of ISFM information, products and extension materials spanning a wide range of crops, soil and water management practices for wide scale distribution and repositories for ISFM information for easy online access were developed by the project,” said Jeroen Huising, project leader. The consortia also proceeded to identify and prioritize ISFM technologies and practices to be further scaled out, based on perceived effectiveness and high adoption potential of these practices. Agronomic trial data was also collected to provide supporting evidence for the selected technologies and practices. The research data collected shows a bias towards research on maize and organic resource management as part of ISFM, and also identifies research gaps. Through policy briefs and position papers the consortia have advocated for policy support and more attention being devoted towards sustainable intensification of agricultural production through ISFM in their respective countries. WASHC was implemented with US$ 1,499,844 donated by AGRA and brought together partners from various stakeholder groups, research institutions, development and outreach partners, farmer organizations and groups, as well as government organizations, private sector input providers and financial institutions. It was implemented in collaboration with the Council for Scientific and Industrial Research (CSIR) Ghana; Institut National de la Recherche Agronomique du Niger (INRAN) Niger; Institute of Agricultural Research (IAR), Zaria, Nigeria; Institute for Agricultural Research & Training (IAR&T) Nigeria; Institut de l’Environnement et de Recherches Agricoles (INERA) Burkina Faso; and Institut d’Economie Rurale (IER), Mali. WASHC Project Closeout Meeting participants in IITA, Ibadan.